For music streaming service Grooveshark, getting their app banned from both the App Store and Android Market did not mean the end of the line. On the contrary, it might be the start of something good. So in order to continue providing free music streaming service to their loyal fans and followers, Grooveshark offers an alternative by way of making its service available via HTML5 web app on all mobile platforms. For those who are not aware, the Grooveshark mobile app was booted out from the App Store and Android Market because of the question put upon the legality of its business model. In fact, the company is currently facing legal hurdles thrown by major music labels due to copyright infringement. So while legal battles are being fought, Grooveshark decided to make a workaround to continue providing its music service and that is by way of making the HTML5 Grooveshark web app. You know what this means right? It’s quite a clever move for Grooveshark to make its service available on the mobile web via HTML5 instead of using other means such as Flash-based web app. For one thing, HTML5 has no problems with the mobile Safari web browser running on iOS devices. For Android, this is not really a problem. This move now enables Grooveshark to be present on other platforms like Windows Phone 7, Blackberry and Symbian or any other Mobile OS which has a modern browser. 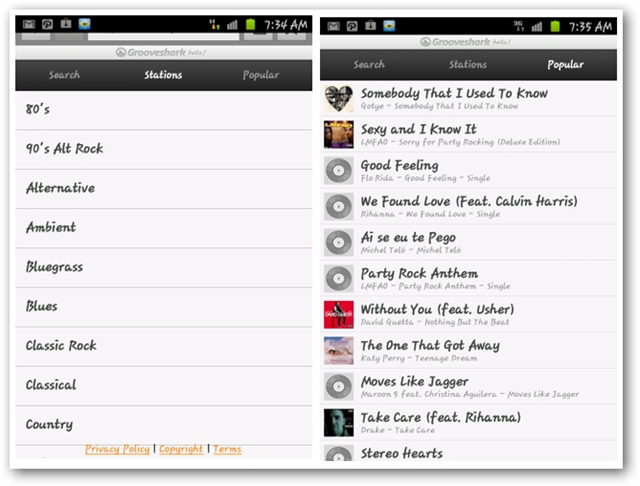 How’s Grooveshark brand new app on both iOS and Android devices? 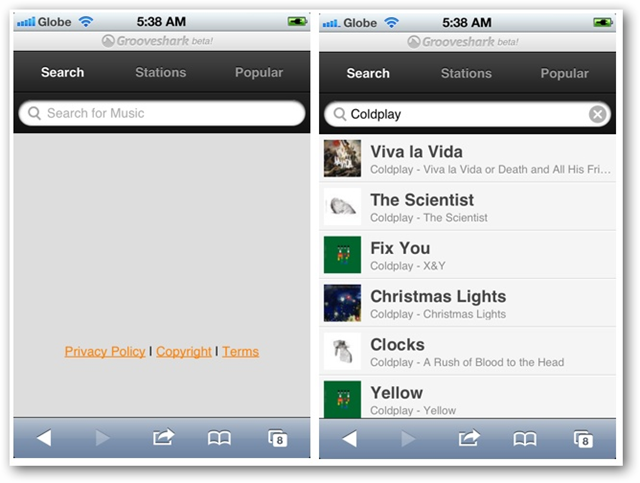 We took the service up for a quick spin and here, we give you our quick impressions on Grooveshark, the HTML5 web app. Of course, using HTML5 platform has its pros and cons. While as mentioned, HTML5 makes Grooveshark workable on iOS devices as compared with using Flash, the service though is not as fully functional as compared with a native app. In short, the Grooveshark HTML5 web app is currently a bare-bone service. By that we mean, you can still search for artists, listen to streaming radio stations or scroll through a list of popular songs on the Grooveshark community right now. The service is pretty good, music streaming is fast and sound quality is clear. For those of you who want a no-frills way of listening to free music while on the go, Grooveshark delivers the goods. As mentioned, Grooveshark web app is still a bare-bone service. So you won’t be able to log into your Grooveshark Premium account just yet. The app’s music player is simple as well. When you select a popular song, for instance, you can stop and play music streaming using the music player interface which is located on the lower part of your device’s screen. While listening to a song, there’s also the option to mark it as “I like the song” and to skip playing it. You can also see the length of the song (in minutes) and see how much of its length is already played. 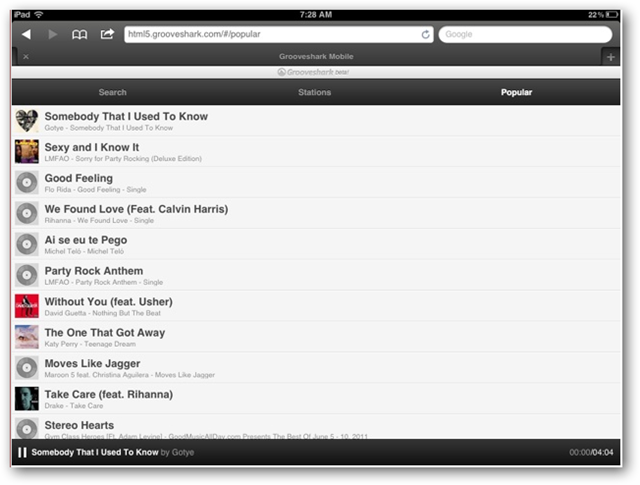 And those are pretty much what you can do with Grooveshark web app. 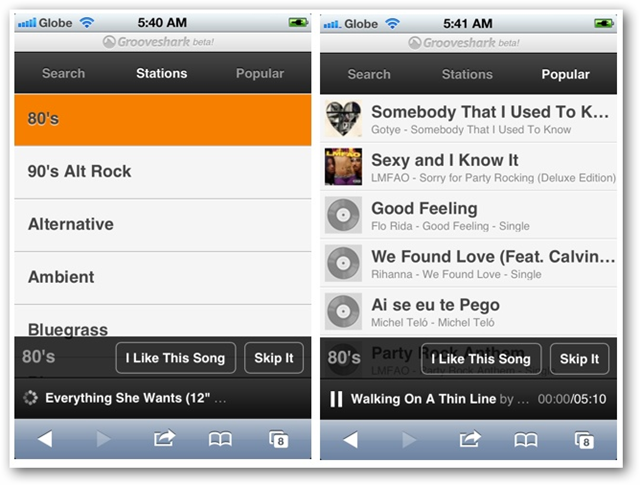 The folks at Grooveshark announced their web app via a short post on their blog. Unfortunately, they did not elaborate on how far they will push this service and what will be their plans for Grooveshark. But then, that’s the least of our worries. Right now, if you want a straightforward music streaming service and you were able to get a taste of Grooveshark, the native iOS and Android app, the HTML5 version will suffice for now for getting your dose of free music streaming on your mobile device. Go give Grooveshark web app a spin by pointing your iPhone, iPad or Android devices’ mobile web browser to html5.grooveshark.com.